My Name is Walid Abdul-Wahab, I live in California and I’m addicted to biohacking. That’s when you look for ways to get fit, super fast and efficient. No, I’m not talking about drugs. I’m talking about bleeding edge health science, diets and workout routines. Things like Crossfit, Paleo and Organic GMO-free food. Eating only the most nutritious foods. Exercising efficiently. “Hacking” your health. When I went for Hajj in 2012, I had stopped drinking milk for a long time because I took a good look at what the dairy industry was doing (injecting drugs into sick cows and milking them with machines) and said no way. One day, while on the pilgrimage, I was craving raw milk. I figured, it must be easier to get it there in Saudi Arabia than in America. On a whim, I told Mairouk about it. And when I heard that, I thought, well, at least you can get it here. Back home of America, it was next to impossible. I trusted Mairouk and took a swig of it. It was rich, creamy with a slight sweetness to it. It tasted like milk… the way it was meant to be. The way it used to be. I was instantly transported back to my childhood. Do you remember what it was like when you drank milk growing up? If you grew up in the 80s like I did, you know what I mean. This was before Genentech and Monsanto figured out they could manufacture artificial Bovine Growth Hormone (BGH) and got the FDA to approve it in 1993. Back then, milk still tasted like… milk. Now, I’m not saying it was all good. Even back then, dairy cows were subjected to antibiotics, feedlots and a corn diet. But… it wasn’t as bad as it is today. There was an innocent beauty to milk back then… and I was tasting it again here in the middle of the desert. So what was this mysterious raw milk my friend got for me? It was camel milk. That’s right. 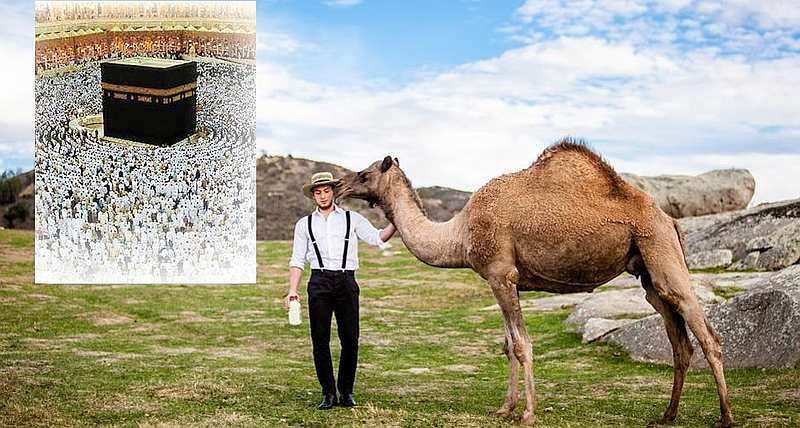 Milk from a camel, just like how the Bedouins in the desert drink it. I thought, this stuff is good. I discovered that camel milk doesn’t have lactoglobulin like cow milk does. Lactoglobulin is the stuff that reacts to you if you’re lactose-intolerant. I read research about the antibacterial and antiviral activity of camel milk’s protective proteins. I read about how camel milk is closer to human breast milk than cow milk and how it boosts the immune system and supports our gut microbiome. I found studies that show it has seven times more B1 vitamins than cow milk, and has insulin-like molecules that make it diabetic friendly. So I started hunting down where I could get camel milk in the U.S. I found it next to impossible to get. There are only 5,000 camels in America spread out all over the country in small family farms. Back then I was studying at USC and so for my final school year project I decided to figure out how to build a business around camel milk. I found some camel farms and started getting milk from them. After selling camel milk at mosques and ethnic food festivals, my business plan won an Award from USC and I started my company “Desert Farms”.